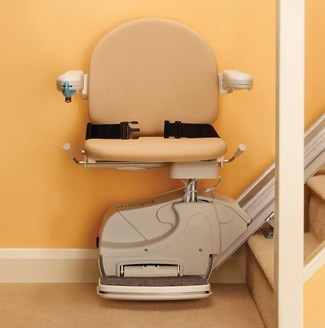 The Minivator Simplicity straight stairlift offers a safe, practical and reliable way of overcoming the problem of getting up and down stairs. If you do not require powered options, and you have a straight staircase, the Simplicity offers you a safe and cost effective way to overcome the challenge of climbing your stairs. The upholstery is available in Sand coloured wipe clean flame retardant fabric. The Simplicity footplate and seat swivel are manually operated. The Simplicity comes with a clip seat belt as standard. The Simplicity Series track offers a continuous charge function meaning that the lift can be parked on any part of the track when it is not in use. This means you do not need to worry about where you leave your lift on the track as the batteries will charge in any position. The Simplicity can have a manual hinge or a Slide Track if required.